3 days ago I was introduced the Sopranos after the boyfriend met the family during the Christmas holidays. The reason? 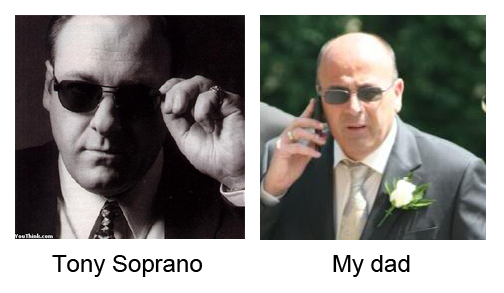 Because he felt whole heartedly how much my father looks like Tony Soprano. Now he also feels like my grandad looks like Clint Eastwood… and until he mentioned it I never realised how much he really does! So 10 minutes into the first episode not only does my dad look like Tony Soprano, but he also act like him in alot of ways! My dad is not a gangster, nor italian or american, but he does dress, sit and says certain things like the character does. Maybe he watched the series years ago and fell in love with the character, but considering I only lived with him up until 2001, and I have alot of memories from before that… I doubt it! So while I am loving the series, I can’t help but see my dad every so often. Before you ask, I am not Meadow!